Kindergarten Elementary School Listing Script, from the name it implies it's a garden for the children’s. Our script list all schools available in and around locations in one place that makes simple to handle hassle free to the users. Our Play School Listing Script Php helps to list all the activities of the school such as worksheets, games, stories, projects, lesson plans, and games etc. there are few levels to address the school list varies from Low nursery, high nursery, low middle level, and first level of transition that a child passes the age. Get entire Elementary School details with logo, facilities, general information and reviews etc. our listing script is the most complete solution for the listing all elementary schools. Parents always searching best kindergarten schools on various basis for that’s why we develop simple and crystal clear website to deliver script without any difficult, any homemaker their favorable kindergarten schools from nearby locations. There is a powerful admin panel from where you can manage the CMS and users using the management module. We have integrated PayPal as the default payment gateway. We have also designed to be mobile and tab responsive and to be SEO-friendly with our advance SEO- friendly coding style in accordance with Google standards. The revenue models include banner advertisements, Google AdSense etc. I would like happily inform that if you buy this script within the next 24 hours. We will make it live on your server, this one time investment and you don’t no need to pay monthly or yearly to renew it.Our Kindergarten Elementary website listing Script is developed with bootstrap. We have a user friendly navigation which makes the website to be accessed from anywhere at any time. 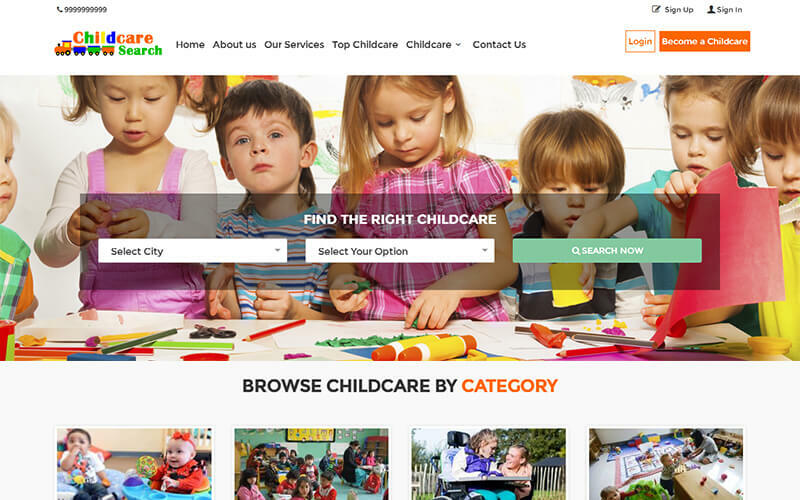 Basic and Advanced Search options, Child care centers list with clear details, Top Childcare, Childcare Booking, Appointments management, Location Management, Category Management, Childcare Management, Review Management, Ad Management, User Feedback Management. Kindergarten script is used to find all the schools nearby to find the best school. It has many advance features to filter out based on the user localities.